Woocommerce product feed manager v2.0.5 is now available via automatic update and the downloads page. Version 2.0 of our WooCommerce Product Feed Manager plugin is a major upgrade from its previous version in which the feed generation process has been overhauled and converted from a real-time process to a background process. The main reason for this important update was that the old versions had difficulties handling feeds with very large product quantities. Switching to a background process also has the advantage that you can continue to work on your feeds whilst the selected feed is being updated in the background. We recommend users update as soon as possible in order to keep your product feeds up to date with the latest bug fixes, security enhancements, and feed requirements. The feed generation process has been overhauled and remodeled from a real-time process to a background process. 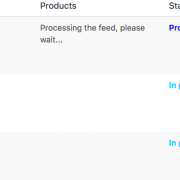 As soon as you start your manual feed update, the correct product ids are stored in a queue and the feed update process will start updating the feed file in the background so you can close the Edit Feed page and work on other feeds or even select other feeds to be added to the feed queue. Whilst in the previous version you had to wait until the feed generation was finished, you now can work on your other feeds as the feed generation work is done in the background. In the feeds list, you can see what feed is being processed and what feeds are in the queue to be processed. We added the “wppfm_category_mapping_exclude”, “wppfm_category_mapping_exclude_tree” and “wppfm_category_mapping_max_categories” filters. You can use these filters to limit the number of categories in the Category Mapping list on the Edit Feed page. Shops with very large numbers of categories can have issues with this Category Mapping list. By using one or more of the mentioned filters you can limit the number of categories and thus prevent issues with the Category Mapping list. Read more about using filters on wpbeginner.com. To use the first two filters you can return an array or a comma-separated string with category id’s that you want to be removed from the Category Mapping list. The “wppfm_category_mapping_exclude” filter will only remove the categories with the given ids, the “wppfm_category_mapping_exclude_tree” filter will also remove the children categories from the list. With the “wppfm_category_mapping_max_categories” filter you can return a number to the filter that will limit the number of categories in the Category Mapping list. We also fixed an issue where attributes from third-party plugins, with a name that started with an underscore, would show up in the WooCommerce Source list as an empty line. In connection with the previous fix, we changed the way third-party attributes show up in the WooCommerce Source list. In the previous version the name of this attribute would be cleaned from underscores, but as of version 2.0, the name will not be cleaned anymore. Fixed an issue where when the user had not selected the “include variations” option, the non-product specific variation data like min_variation_price or max_variation_price would not be included in the main version of the variation product.